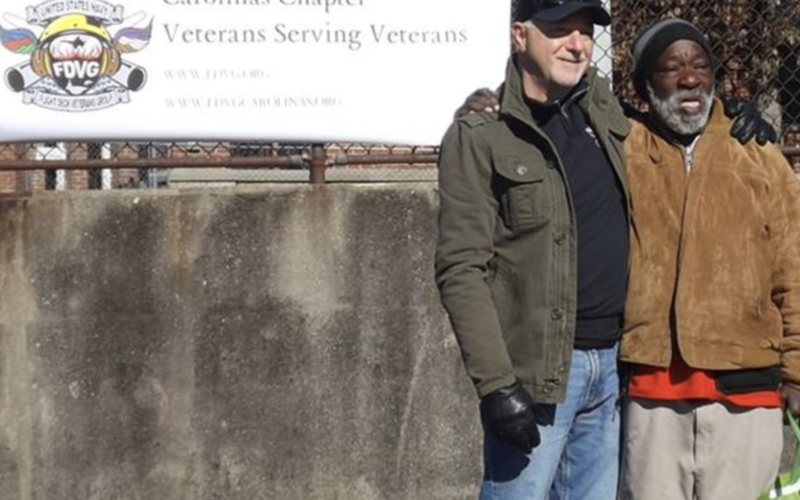 ‘We are just a few veterans who care, We are veterans serving veterans! Say’s Bill Parks; Commanding Officer of the duel state Carolinas Chapter. Special thanks to FDVG member and coordinator Michael Moss who oversaw this project, Christmas came a little early for Ashville NC. homeless veterans. We decided to put our money together, purchase as many coats, boots and food as we could and try to make an impact on a fellow veterans life; says Moss. More than half a dozen FDVG member’s plus their wives showed up to support the cause. It’s the little things like this that have big impacts on peoples lives, we’re just trying to do everything we can to fill a void and show some love for fellow veterans who have fallen on hard times; says Michael Deacon; FDVG’s Executive Officer. I couldn’t be prouder of the Carolinas Chapter and their wives for everything they’re doing to support area veterans. My hope is the example they are setting will echo across the country to other state chapters and encourage the same efforts; says Jared Ashley CEO/Founder FDVG.